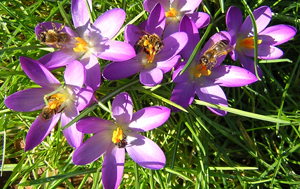 An intensive course to get you started, explaining all about the honey bee, helping you choose your hive and equipment, how and where to set up your apiary, the bees management and pests and diseases. Not forgetting when and how to extract that lovely honey. 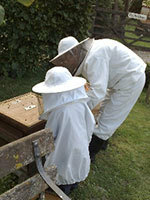 An informal couple of days spent with others interested in beekeeping. A wealth of information from a highly experienced beekeeper and a chance to see the different equipment available, along with a useful pack of course notes to take away. Refreshments will be provided, including a buffet lunch and a 'honey-themed' cake. 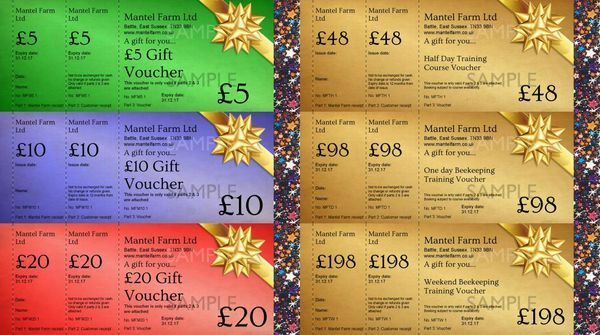 Parking is available at the entrance to our farm and our training room is just short walk down our track. 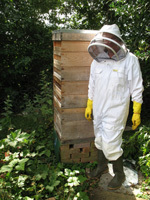 Where the bees and weather allow, this course will include an inspection of a hive. Just bring yourself, confirmation of your booking, a notebook and any questions you may have, along with a bee suit, wellies and gloves (please contact us in advance if you need to borrow a suit). If you have any dietary requirements please let us know in advance. Amanda is a professional ecologist who has been keeping up to 25 colonies of bees for about fifteen years. 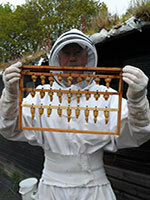 Mike has been a Beekeeper since 1972 and has attained many BBKA modules. Jill keeps up to 6 colonies of bees and has been both teaching and beekeeping for many years. Click her picture for more information. Click his picture for more information.